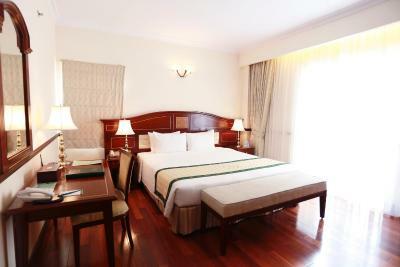 Lock in a great price for Saigon Dalat Hotel – rated 8.2 by recent guests! The location was great! About 20 minute walk to the market, 6 minute walk to the Crazy House. Really comfortable and large king size bed, which was REALLY comfortable! Spacious room. They give you bath salts, which is nice and the complimentary tooth brush was really good. Tea and coffee and two small complimentary bottles of water in the room each day were great! Small fridge and safe in the room were much appreciated! TV has several English channels. Front desk staff were very friendly and some spoke good English! 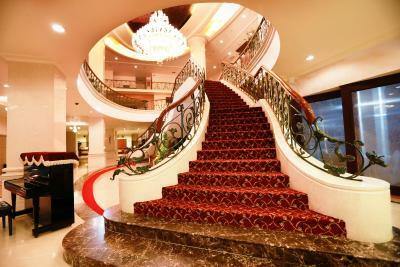 This is a grand hotel, we had a city view and seeing the sunrise over the city was amazing! It was very clean, breakfast was excellent, the staff was very helpful in providing advice on getting around and helping us book transport. Pick up and drop off transport was also a breeze. 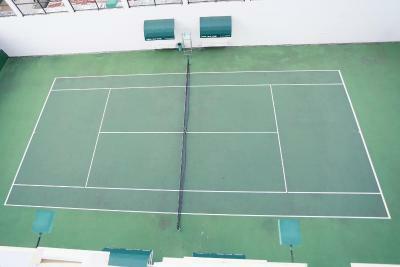 The property is in a central location and also a very easy drive to many sites. I liked that there were many Vietnamese locals staying there. I highly recommend! 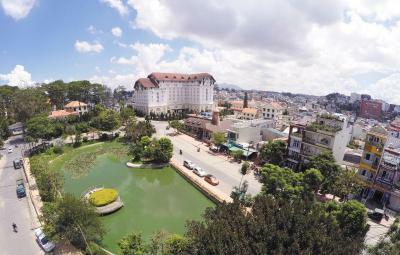 Great location for exploring Da Lat. Taxis congregate out front, so it's always easy to find a cheap ride. Breakfast buffet was pretty expansive, but predictable. 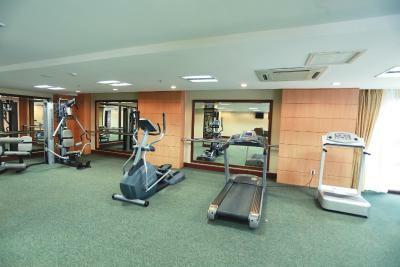 The room and facilities in the room were very good. 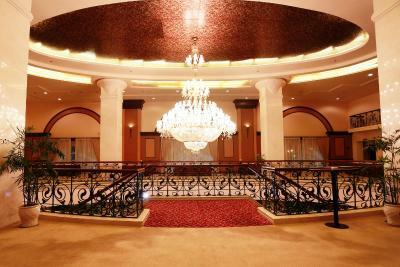 The location of the hotel is very central - although you will need for most things a taxi (e.g. train-station 10m by taxi, crazy house 5-10m, etc.). It is a bit run down but you could tell it would have been really nice hotel back in its glory days, I stayed for three nights and did not have a problem with any thing. The hotel was clean, it had everything it advertised, plus better! 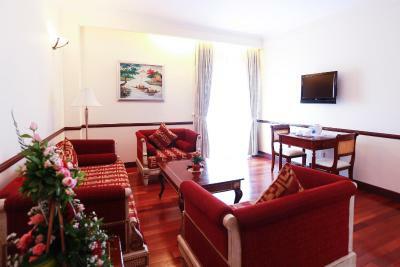 Staff were very friendly, most could speak enough English to make the stay easy. Very honest, no hard sell, but reserved our ongoing flight, and had a good sense of humor. 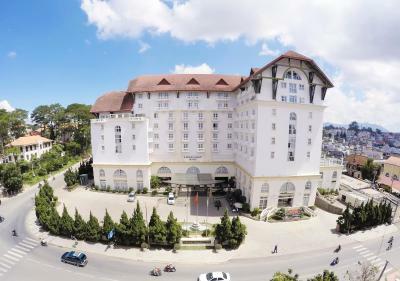 Saigon Dalat Hotel This rating is a reflection of how the property compares to the industry standard when it comes to price, facilities and services available. It's based on a self-evaluation by the property. Use this rating to help choose your stay! 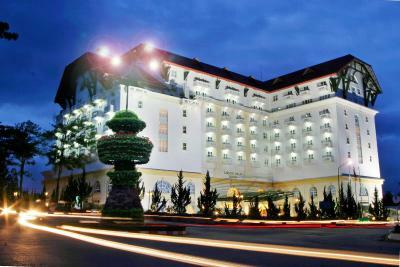 The hotel is within a 10-minute walk of Da Lat Market and Da Lat Flower Gardens. 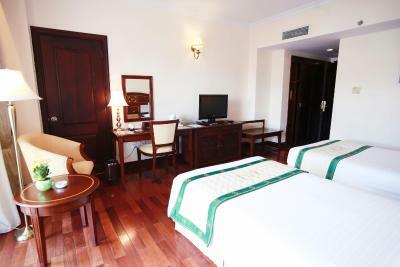 Bao Dai's Summer Palace is a 15-minute walk away, and the popular Valley of Love is accessible within a 20-minute drive of the hotel. Lien Khuong Airport is 19 miles away. 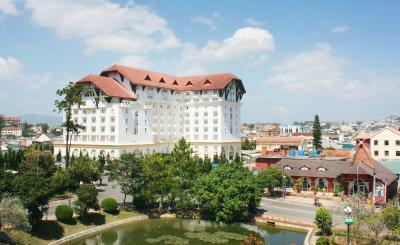 When would you like to stay at Saigon Dalat Hotel? 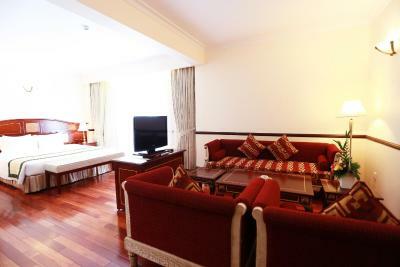 These air-conditioned rooms feature parquet floors, a personal safe, a minibar, a flat-screen satellite TV and a sitting area. The private marble bathrooms have a bathtub or a shower, a hairdryer and free toiletries. Including a balcony, these air-conditioned rooms feature parquet floors, a personal safe, a minibar, a flat-screen satellite TV and a sitting area. The private marble bathrooms have a bathtub or a shower, a hairdryer and free toiletries. Fitted with a living room and balcony, these larger air-conditioned suites feature parquet floors, a personal safe, minibar, a flat-screen satellite TV and sofa sitting area. 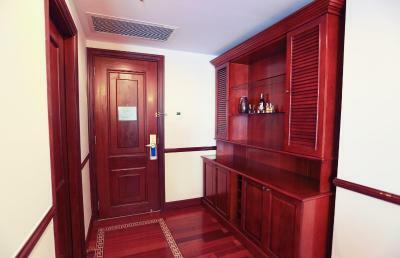 The private marble bathroom comes equipped with a bathtub or shower, hairdryer and free toiletries. 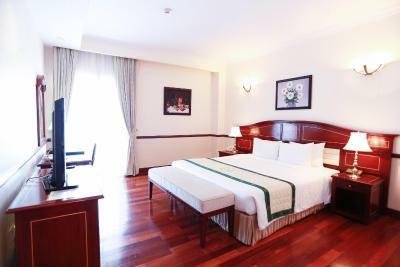 Fitted with a separate living room and balcony, spacious air-conditioned suites feature parquet floors, a personal safe, minibar, a flat-screen satellite TV and sofa sitting area. 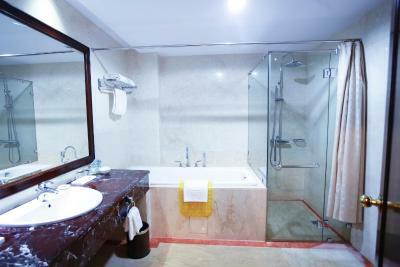 The private marble bathroom comes equipped with a bathtub or shower, hairdryer and free toiletries. 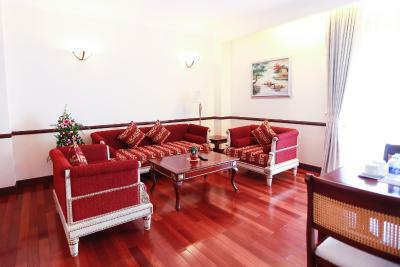 House Rules Saigon Dalat Hotel takes special requests – add in the next step! 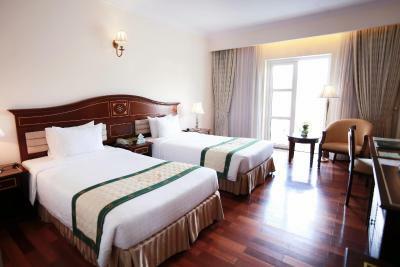 Any additional children or adults are charged VND 700269.80 per night for extra beds. 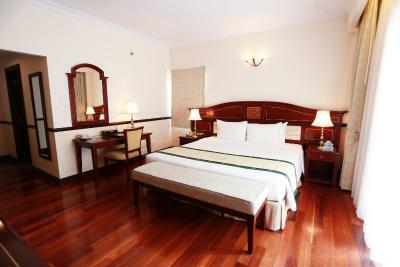 Saigon Dalat Hotel accepts these cards and reserves the right to temporarily hold an amount prior to arrival. Please note that 2 children under 11 years of age can stay for free on existing beds. Please be informed that Saigon Dalat Hotel will pre-authorize your credit card anytime after the booking has been made for guarantee purposes only - this is not a charge. The pool was closed half the time due to other events. The breakfast, lunch and dinner was not comparable to other Vietnamese restaurants - very poor. My room was missing a shaver and iron, but they provided it on request. The TV was small compared to other hotel rooms, and it had constant rolling lines, which was quite annoying. The curtains didn't close properly so I was woken up quite early by the sun. I was in Room 409. 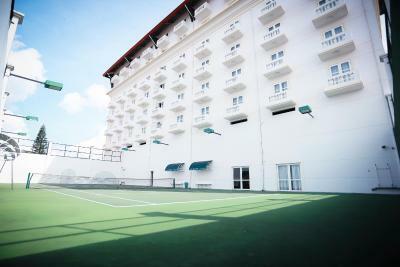 I asked for a quiet room and while the street noise was quieter on the side of the hotel facing the tennis court where I was, the room was right at the elevator and across from the cleaning staff room, so in the morning it was quite noisy with chatter from the hall, inhibiting my desire to sleep in. After I complained and asked to change rooms, I was offered a room on the 5th floor. It had a much bigger TV, and 2 sitting chairs rather than the one that I had. Sadly, the room faced the busy street and so there was the sound of car horns to contend with. Finally, the tub is great, but so very high to climb into. I would not recommend this for seniors as the chance of falling is great. There is only a hand held shower hose and a shower head, no tap, so to fill the tub I had to use the shower. The way it's set up no matter what, the water leaked over the ledge around the bathtub and the floor was all wet. Finally, when I went to swim at the pool, there were no towels. Breakfast buffet seemed better the second day with more options - not sure why, maybe there were more groups? Basic dishes, but OK, the meat very tough - reminded me of when I lived in China. Feels like it is past her best days. Staff is very strict when it comes to hotel policy. The hotel lies in this listing by saying that guests can use the swimming pool. We stayed a few nights, and the swimming pool was closed because they rent the pool for private parties and weddings basically every day. They would show the same sign everyday in the elevator "sorry for the inconvenience the pool is closed". Another problem is that there is some loud music from the first floor that can be heard even until up to 10 pm, because of the private parties on the first floor. Another problem is that the hotel would change the schedule of the breakfast based on these private parties, sometimes ending at 9 AM or 10 AM, which is really annoying. Thus, it feels as if the guests of this hotels are second rate customers compared to those who attend the private parties on the first floor. Besides, the walls are not really soundproofs in this hotel. We could hear the guests from the room besides us talking, even if they did not speak loud, and we were woke up by their alarm in the morning. 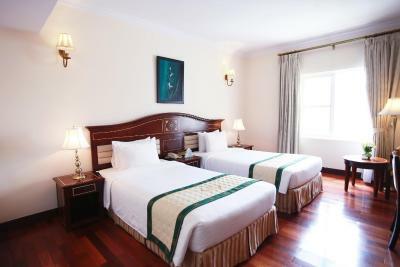 Overall, although this hotel claims to be 4 stars, it feels like a 3 star hotel, due to some bad management, where regular guests are treated as second rate clients. The advertisement of this hotel is deceptive as it shows a very beautiful pool that is reserved for the private parties, and we could not use! The restaraunt meals and service. It said the room had a balcony, what it didn't say was you couldn't sit out there. We asked for a walk in shower and didn't get instead we had to climb into a very high bath to have a shower and the water went everywhere. Security officer - Hưng was nice to us. Nothing to complain about. 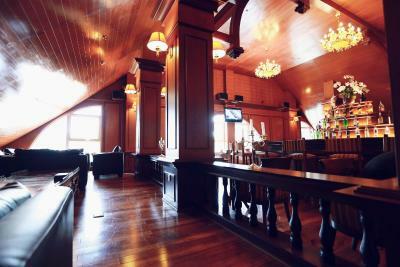 If you are in DaLat I would stay here again.